Today‘s automotive world is full of surprises, unexpected situations and news. We often hear about many new products or accessories recently developed and born in many variations, markets and styles. 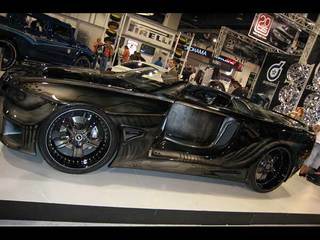 The automotive world is living its fast life and more and more frequently we meet cars that look very futuristic. Of course it’s still a master piece of one of many manufacturers and their teams full of professionals. The word car is connected with the word music from the beginning. The music is the car’s essential part in of form of various car stereo and set of speakers with possibility of other gadgets. And when we imagine a combination of two super-powers like the German BMW and Japanese car-audio master Alpine, maybe there’s nothing better. And the combination is a showcar for last year by Alpine that is everything but not normal. 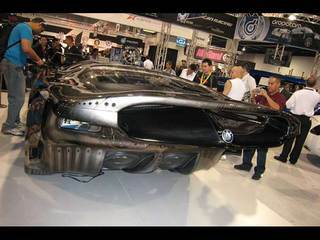 Please, welcome the lord of darkness called Alpine BMW 645i Sinister Six. The love between the tuning scene and BMW vehicles may has no limits. More and more frequently we can see new models and tuning cars from all over the world. The BMW cars are real symbols of elegance and distinctive lines, so that’s why majority of tuning companies remain this hidden potential intact. But the Sinister Six isn’t conservative. Alpine, a Japanese professional in car-audio stuff, knows very well why they’ve chose the BMW 6 for its showcar. This company was founded in 1967 and it’s based in Tokyo. They work on audio systems for cars like head-units, speakers, and stereos with DVD and satellite navigation and much more. They do their job perfectly and this is frequently proven by many awards and satisfied customers. Simply said, the Alpine company belongs to the top in the world. And you know what cars such as Mini Cooper, BMW X5, Honda Civic or Citroen C2 have common? All of these cars were Alpine‘s showcars. And if you didn’t forget, you know that these showcars were quite crazy modified. And today’s BMW 6 isn’t an exception. Be honest, how many hybrid cars you’ve seen in your life? Because Alpine USA did something to that BMW 6, that isn’t usual even among ordinary tuning companies. 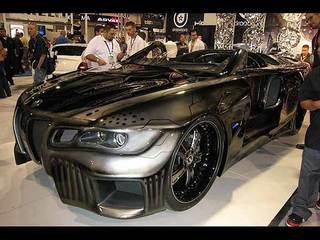 Need for attraction is at the top and this car is its proof. And this everything is possible thanks to Steve Brown and Gary Bell from Alpine’s Advanced Application R&D team. It’s not very visible for the first time, but when you look closer at the wheels...and there are other doubts. I can hardly find appropriate words how to call this thing on four wheels, but it’s a car. But it’s undoubtedly something we can’t see every day. Ladies and gentlemen, please meet the showcar Alpine BMW 645i Sinister Six aka Mr. Furious. Confess, that nobody expected so radical change of the stock car. The complete rebuilt of ordinary BMW 645 to this mad masterpiece consists of exterior and interior changes. It’s a completely reworked stock car. And now you can see the result of many hours spent in a workshop of two guys from the Alpine USA team. They had accepted the will of their management and built a company showcar to be famous on the stage. So they took an ordinary BMW 645i Convertible (price $82.000) and started to make something unique. The first step was about the car‘s complete cleaning – removal of body and interior and then continues replacement with easily tractable wood. Especially this material is the number one in many parts of the car, like the interior or trunk. It is used particularly together with Alpine products. But we’ll talk about these later. But what attracts first? It’s a futuristic design in Aliens style that’s really elaborated. As we said before, all body parts were removed and only skeleton remained. 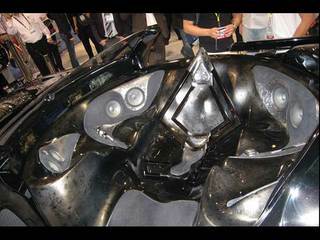 And then the time for really mad bodykit made of glass fiber came. The car is now wider for about 23cm on each side so something big happened. Again it’s very hard to find right words, because there is many details we can find on the car. The front part has a typical BMW mask, but a little bit stretched and filled with a grey perforated sheet. Between the mask and original headlamps we can see a pair of fancy openings in the bumper. But more interesting part of the front is a pair of big spurs with integrated cut-outs on the bumper’s sides to cool down the front brakes. I think there’s no more massive BMW?. Because the core is the BMW convertible, the roof was erased and now it’s a convertible forever. Additionally the frame of front windows was lowered so the glass too. Fluent lines continue from the front part through the broader bumpers to elaborated sides of Mr. Furious. But we can’t talk about some side sills installed. There are only some decent, but visible shapes of this part. Their main characteristic is four very nice shaped openings with blue illuminated Alpine signs. The elements like these are sometimes a perfect glitter to a car’s design. But the most shocking feature of the side is doors. There aren’t. We’ll talk later about this aim. So now there are two pairs of cooling openings for the brakes. Of course, the dark perforated sheet can’t miss. So, now it’s time for one of two most interesting improvements made on this car. It’s a completely and maximum possible modified rear of Sinister Six. I think you’ve seen Ferrari F50 and its rear part with a decent wing and visible engine space. So this is exactly used in our case. Similar massive, wide rear parts, big plexi-glass not over the engine, but audio system. So when Alpine produces car-audio components and this BMW is a showcar, we can expect Alpine’s products everywhere. We need to say that the big glass extends during boarding to enjoy nine brand-new products from Alpine’s portfolio – powerful amplifiers (8x Alpine PDX1.1000 & 1x Alpine PDX4.150) and 9000W of raw power. And this is just the beginning. There’s much more to show on this car. The designers continued to the rear part of the car. An amazing rear bumper with a pair of integrated exhaust tips on its sides and of course some nice diffuser can’t miss. But the diffuser isn’t something ordinary – it consists of four 12“ bass loud speakers Alpine SWX-1242D turned to the ground for a real big bang. No time to chill, because skewed tail-lamps aren’t made of LEDs as you can think. They’re LCD monitors that are switched every 30 seconds from their „brake mode“ to playing your favorite music videos. DO you think that 30 videos are enough for you? There’s another Sinister Six writing in the tight mask between the lights. There are many more similar all over the car. So the huge modification needs also a nice suit. 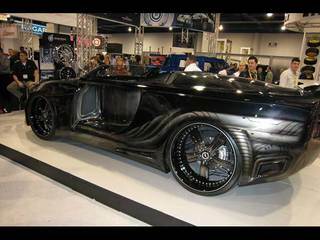 This car wears a very nice black color from guys of House of Kolor. But there’s not only black all over the car, but an airbrush master Noah used his skills to create an alien style airbrush cover. This superb airbrush shows many aliens and their typical world. It’s a great step to the ultimate showcar. Some „minor“ changes were made also on the suspension. You think that 22“ rims on the BMW are too much? And what about 24“ rims in front and 26“ at the back? Please, meet Sinister Six. 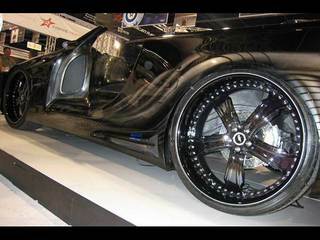 The exclusive double-part 5-spoke black rims are made by the famous hot-rod producer Boyd Coddington. These heavy rims are also very wide – 10" and 13". These gigantic rims wear Falken tires Falken ZiEX S/TZ. You can imagine that 360 mm Brembo vented brake discs look quite small compared to the rims. But now we continue to the interior, because not also the exterior has been changed. The interior is completely changed. We can start with a fact, that now the car isn’t a four-seater. It’s a single seater, but this seat isn’t in the middle as we can expect, but it’s more radical as we‘ve never seen before. The verdict says – a central rotating console. Yes, there’s a rotating console instead of one seat and it’s something like a old-school chopper seat and bodykit full of implemented Alpine’s products. In reality it’s a circle placed on the floor with a place for one passenger or driver respectively. Many speakers and other Alpine units are installed around the circle. The whole thing looks like some Star Trek base. When you push the button, the unit does 90o left turn allowing boarding and getting out. And the rear trunk cover slides to show the amplifiers. Quite amazing, isn’t it? Also the console’s design is perfect, a real combination of beauty and usefulness. The turn of the console reveals on the right a pair of amplifiers (1x Alpine PDX1.1000 & 1x Alpine PDX1.150), that can produce more than 10.000 watts of music power together with next 9 units. All of this power is controlled by a complete multimedia brain Alpine VPA-B222R VehicleHub Pro OEM, the newest Alpine’s product. It’s integrated on the left side and all other elements are connected with it. 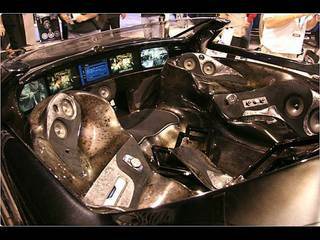 These elements include five 10“ LCD monitors integrated to the custom dashboard, DVD players with iPod Alpine DVA-5210 connector, multi-channel audio system controlled by Alpine PXA-H701 Dolby Pro Logic processor. And the most important thing – the most quality sound is provided by a pair of Alpine SPX-107R speakers and four central speakers Alpine SPX-17MB placed in front and the back of the rotating console + one piece in front of the seat. We need to point out, that the side LCD panels are used as „external mirrors“ providing images supplied by a pair of mini cameras on the car’s sides. Other panels are used as a multimedia machine for DVDs and other visual stuff. Voila, so that’s the Alpine’s showcar. It’s hard to say some final result, because it’s a very unusual and rare tuning. What is your opinion about BMW 645i Alpine Sinister Six tuned by Alpine Electronics?